Hullo, friends! I’m super excited to be sharing a book review with all of you today! I was given an eARC of this to review, and I enjoyed it spook much! Up until lately, I’ve been reading a lot of good books, but Reintegration is the first book in a while that’s made me fangirl and really really enjoy reading it. As mentioned above, I received a free ARC of this book, but all thoughts are my own, and I wasn’t required to give a positive review (I just loved it!). Oh. My. Goodness. Where to start with this review????? There are so many things I loved! I loved the plot of this book! It was super exciting and kept me reading, but there was also a lot of slower spots where there was a lot of character development, which was sooo good. And just the whole idea of a dystopian society like this (I’m trying to fangirl without spoiling!) and trying to erase someone’s memories to make them fit into society…. It was so good, and such a fun ride! I also loooooved the plot twists, too. I saw some of them coming, but it was the kind of “seeing it coming” that was really satisfying when I was right. Katherine: I usually tend to like side characters more than main characters, but I actually really liked Katherine. She was multi-layered, and her doubt over everything she’d been taught was portrayed in a realistic and believable way. I loved her progression from perfect student to doubt and beyond. You can tell from the blurb that she begins to question things, but it wasn’t done in a cliche or forced way, and her inner conflict was portrayed SO WELL. There were a few times I didn’t like things Katherine did (there was some tension at one point where all I could think was “just ASK HIM!!!!”). Despite that, I really liked her! Chelsea: At first I thought she was just going to be a foil to Katherine and a side character, but I like what happened with her. Without spoiling anything, I have to say that I loved her role in the plot twist that I did not see coming. Haynes: I knew her role in the story as soon as we first met her, and she was sooo good! Honestly, she was very chilling and a good villain, although she did fall into monologuing/revealing evil plan mode a few times. Thompson: AHHHH THOMPSON. Basically he is awesome and I very much want to hug him and protect him. That is all. I don’t usually talk about themes much when I review books, but this book… The terms were at the root of the plot, so I can’t really mention one without mentioning the other. This dystopian society was so realistic because their views on tolerance we’re so similar to those of our society today–these people had just taken this to the next level. I loved the portrayal of right and wrong as absolute (in spite of what society said). Plus, the way guilt was described without being called guilt was just amazing!!! Overall, this book portrayed its theme so well, and I immensely enjoyed it! Overall, I immensely enjoyed this book, and I highly recommend it. It’s a fun, clean story, with great Christian themes and an awesome plot. You can check it out on Amazon, Createspace, Barnes & Noble, and Goodreads, and follow Ashley Bogner’s blog. You can also read more about the book in my cover reveal post. Do you want to read Reintegration now? (Do it, do it, do it!!!) Have you already read it? Comment below! Hullo, friends! I’m still getting responses on the poll I posted, but I thought I would go ahead and share this post with you that I’ve had sitting in my drafts for a while. This is inspired by Rachelle Rea Cobb’s post called 20 Ways To Support Your Favorite Books. Go check it out, and take a look at her books, too, while you’re over there! Fangirl over their books. On their blog, on Goodreads, to your friends, to that random stranger who asked you what you’re reading on the bus. Sharing your love for the book(s) with others will pique their interest. And who doesn’t want friends to fangirl over a book with them? Share on social media. If you have a Twitter account, tweet a cool picture and a quote from the book! Post your thoughts on Goodreads while you read. Find the author on Pinterest and follow them. Like their Facebook page. Sharing your love for the book and the author goes a long way. Write fanfiction. Some authors don’t like fanfiction, but many do. Have a random idea about what may be happening behind the scenes? Like a side character and want to write about how they saved the world? Found a spot where the author hints at something that happened and want to guess what it is? Write a fanfic! It doesn’t have to be long. Even a short fanfic can remind an author that people love their book. Write a review. Reviews help authors a lot. On Amazon, reviews determine how easy it is to find a book when searching, and readers are more likely to pick up a book if it has a lot of great reviews. Along with that, you can post reviews on Goodreads and your own blog. Authors also love it when you use gifs and fangirl in your reviews! Participate in events. Whether your favorite author is hosting a giveaway, a blog tour, or doing a Q&A, they want to interact with you! Ask them questions, offer to help spread the word on social media, and provide suggestions for future events. Authors love having help when they host big events. Share quotes. A good, memorable quote can grab someone’s attention, especially if it’s a relatable one. And while it’s easier to make quote pictures for movies because you can use pictures from the movie, books are fun to do, too! If you don’t want to do pictures, you can always just tweet a quote or add it on Goodreads. Give the book as a gift. While Christmas may be half a year away, there are still many opportunities to give gifts, like birthdays and graduations. If you have a book you love, think about sharing it with your favorite bookworm. After all, what bookworm doesn’t love getting free books? I hope you enjoyed this post, and hopefully you’ll be able to use a few of these ideas to help motivate your favorite authors. Comment below on which of these you’ve done, and don’t forget to share this post with your fellow bookworms! Speaking of things authors love, I’d love for you to find me on social media! If you haven’t already, be my friend on Goodreads and follow me on Pinterest! There’s also a group board for the IDIA series on Pinterest, which you can join by commenting on this picture. Check it out! Hullo, everyone! It’s been a while since I’ve posted! I meant to take a small hiatus, and then accidentally took a quite long hiatus. Whoops. Never fear, I’ll be posting another part of Twinepathy tomorrow. Until then, I have a special post for today. Jaye L. Knight’s newest book in the Ilyon Chronicles has just been released! I’ve really loved this series, and I’m very excited about Samara’s Peril! In fact, today I was supposed to do a review of it… but since I haven’t finished reading it yet, that would be very difficult. 😉 Instead, I’ll be telling you about my introduction to this series and posting my original review of Resistance, which… well, I must admit, it involved a lot of fangirling. 🙂 Hopefully this will convince you to give the series a try if you haven’t already! I had seen the Ilyon Chronicles around quite a bit, and seen a lot of fangirling about it. I actually had the books on my Kindle for a while before I actually got around to reading them. 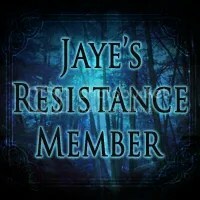 And here’s a fun fact – Resistance was the first fantasy book I read after reading The Lord of the Rings. Surprisingly enough, I enjoyed Resistance just as much as Tolkien’s classic, only in a different way. Resistance had amazing characters and awesome Christian themes, and now this series is one of my all-time favorites. I was very pleased to hear that there are quite a few more books in the making. *rubs hands in happy anticipation* On to the review!!! Oh oh oh, where to start? I absolutely loved all of the characters. I really, really, really love Jace. He’s amazing. I also love Tyra. ❤ I desperately want a wolf for a pet now. Or maybe not. A very tame wolf, thank you very much. As in, my dog. And then Trask and Tane and Kaden and Kyrin and Rayad OH RAYAD and Kalli and Aldor *sniff* and Lenae… I can’t find room to list everyone!!!!! AND THEN THE PLOT! I love the switching third person POV, and all of the tension. These poor characters are getting tortured. *sniff sniff* Now that I look back on it, it’s not quite as bad as that. And I do the same thing in my own writing… But I also love all the faith themes and the introductions of different races. Several executions, and many people get injured. Nothing too graphic. No other questionable content. And now I have more! When I wrote this review for Resistance, I was already pretty far into The King’s Scrolls, and now I have Samara’s Peril. And speaking of Samara’s Peril, let me introduce you to the star of this blog tour! When news arrives that Emperor Daican has been in contact with his chief war strategist, it signals potential doom for the country of Samara. Determined to intervene, the resistance in Landale, headed by Lady Anne, embark on a covert mission in hopes of unearthing further information. However, a shocking discovery leads to complications no one could have foreseen. Armed with their newfound knowledge, they set out for Samara to warn the king. War is inevitable, and they must face two desperate battles—one on the walls of Samara’s great stronghold, and the other on the battlefield of Jace’s heart, where victory might only be achievable through great sacrifice. Available now on Amazon, Barnes & Noble, and iBooks! Haven’t discovered the world of Ilyon yet? Find out more at the official Ilyon Chronicles website! Jaye L. Knight is an award-winning author, homeschool graduate, and shameless tea addict with a passion for Christian fantasy. Armed with an active imagination and love for adventure, Jaye weaves stories of truth, faith, and courage with the message that even in the deepest darkness, God’s love shines as a light to offer hope. She has been penning stories since the age of eight and resides in the Northwoods of Wisconsin. Check out the full tour schedule and the awesome Rafflecopter giveaway on Jaye’s blog!